CO-6: Apply basic concepts of probability, random variation, and commonly used statistical probability distributions. A fair coin is tossed twice. Let the random variable X be the number of tails we get in this random experiment. and 2 (if we get TT). In general, we’ll write: P(X = x) or P(X = k) to denote the probability that the discrete random variable X gets the value x or k respectively. Many students prefer the second notation as keeping track of the difference between X and x can cause confusion. Here the X represents the random variable and x or k denote the value of interest in the current problem (0, 1, etc. ). Note that for the random variables we’ll use a capital letter, and for the value we’ll use a lowercase letter. The way this section on discrete random variables is organized is very similar to the way we organized our discussion about one quantitative variable in the Exploratory Data Analysis unit. It will be separated into four sections. We’ll first discuss the probability distribution of a discrete random variable, ways to display it, and how to use it in order to find probabilities of interest. We’ll then move on to talk about the mean and standard deviation of a discrete random variable, which are measures of the center and spread of its distribution. We’ll conclude this part by discussing a special and very common class of discrete random variable: the binomial random variable. LO 6.12: Use the probability distribution for a discrete random variable to find the probability of events of interest. When we learned how to find probabilities by applying the basic principles, we generally focused on just one particular outcome or event, like the probability of getting exactly one tail when a coin is tossed twice, or the probability of getting a 5 when a die is rolled. Now that we have mastered the solution of individual probability problems, we’ll proceed to look at the big picture by considering all the possible values of a discrete random variable, along with their associated probabilities. This list of possible values and probabilities is called the probability distribution of the random variable. In the Exploratory Data Analysis unit of this course, we often looked at the distribution of sample values in a quantitative data set. 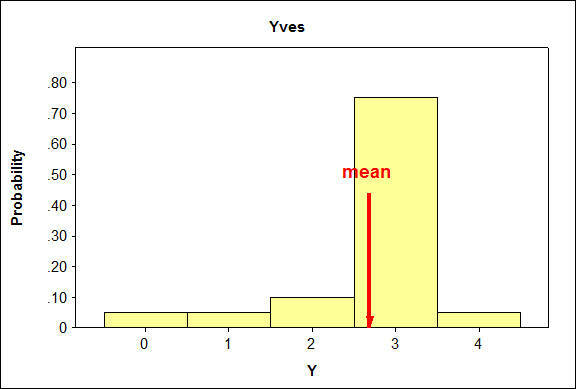 We would display the values with a histogram, and summarize them by reporting their mean. In this section, when we look at the probability distribution of a random variable, we consider all its possible values and their overall probabilities of occurrence. Thus, we have in mind an entire population of values for a variable. When we display them with a histogram or summarize them with a mean, these are representing a population of values, not a sample. The distinction between sample and population is an essential concept in statistics, because an ultimate goal is to draw conclusions about unknown values for a population, based on what is observed in the sample. In the examples which follow we will sometimes illustrate how the probability distribution is created. We do this to demonstrate the usefulness of the probability rules we previously discussed and to illustrate clearly how probability distributions can be created. As we are more focused on data driven methods, you will often be given a probability distribution based upon data as opposed to constructing the theoretical probability distribution based upon flipping coins or similar classical probability experiments. Recall our first example, when we introduced the idea of a random variable. In this example we tossed a coin twice. What is the probability distribution of X, where the random variable X is the number of tails appearing in two tosses of a fair coin? We first note that since the coin is fair, each of the four outcomes HH, HT, TH, TT in the sample space S is equally likely, and so each has a probability of 1/4. X takes the value 0 only for the outcome HH, so the probability that X = 0 is 1/4. X takes the value 1 for outcomes HT or TH. By the addition principle, the probability that X = 1 is 1/4 + 1/4 = 1/2. Finally, X takes the value 2 only for the outcome TT, so the probability that X = 2 is 1/4. X takes the values 0, 1, 2 and P(X = 0) = 1/4, P(X = 1) = 1/2, P(X = 2) = 1/4. Note that events of the type (X = x) are subject to the principles of probability established earlier, and will provide us with a way of systematically exploring the behavior of random variables. In particular, the first two principles in the context of probability distributions of random variables will now be stated. The probability distribution for two flips of a coin was simple enough to construct at once. For more complicated random experiments, it is common to first construct a table of all the outcomes and their probabilities, then use the addition principle to condense that information into the actual probability distribution table. A coin is tossed three times. Let the random variable X be the number of tails. Find the probability distribution of X. First, we specify the 8 possible outcomes in S, along with the number and the probability of that outcome. Because they are all equally likely, each has probability 1/8. Alternatively, by the multiplication principle, each particular sequence of three coin faces has probability 1/2 * 1/2 * 1/2 = 1/8. Then we figure out what the value of X is (number of tails) for each possible outcome. P(X = 1) = P(HHT or HTH or THH) = P(HHT) + P(HTH) + P(THH) = 1/8 + 1/8 + 1/8 = 3/8. Similarly, P(X = 2) = P(HTT or THT or TTH) = 3/8. In the previous two examples, we needed to specify the probability distributions ourselves, based on the physical circumstances of the situation. In some situations, the probability distribution may be specified with a formula. Such a formula must be consistent with the constraints imposed by the laws of probability, so that the probability of each outcome must be between 0 and 1, and the probabilities of all possible outcomes together must sum to 1. We will see this with the binomial distribution. 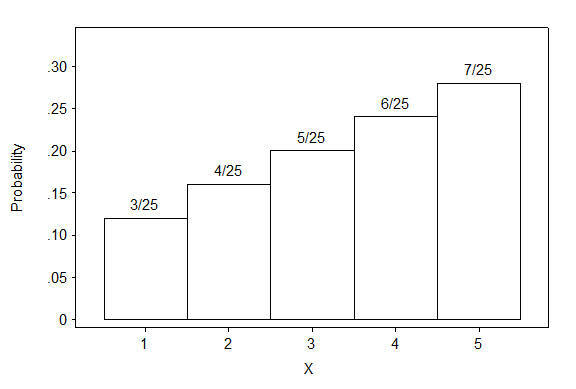 We learned to display the distribution of sample values for a quantitative variable with a histogram in which the horizontal axis represented the range of values in the sample. The vertical axis represented the frequency or relative frequency (sometimes given as a percentage) of sample values occurring in that interval. The width of each rectangle in the histogram was an interval, or part of the possible values for the quantitative variable. The height of each rectangle was the frequency (or relative frequency) for that interval. Similarly, we can display the probability distribution of a random variable with a probability histogram. The vertical axis represents the probabilities of those values. Here an example of a probability histogram. (Such probabilities are not always increasing; they just happen to be so in this example). Notice that each rectangle in the histogram has a width of 1 unit. The height of each rectangle is the probability that it will occur. Thus, the area of each rectangle is base times height, which for these rectangles is 1 times its probability for each value of X. This means that for probability distributions of discrete random variables, the sum of the areas of all of the rectangles is the same as the sum of all of the probabilities. The total area = 1. For probability distributions of discrete random variables, this is equivalent to the property that the sum of all of the probabilities must equal 1. We’ve seen how probability distributions are created. Now it’s time to use them to find probabilities. How many times did you change majors? The results are displayed in a probability distribution. What is the probability that a randomly selected senior has changed majors more than once? This can be written as P(X > 1). We can find this probability by adding the appropriate individual probabilities in the probability distribution. As you just saw in this example, we need to pay attention to the wording of the probability question. The key words that told us which values to use for X are more than. The following will clarify and reinforce the key words and their meanings. Let’s begin with some everyday situations using at least and at most. It means that 10 pages is the smallest amount you are going to write. In other words, you will write 10 or morepages for the term paper. So, for example, writing 9 pages would be unacceptable. On the other hand, suppose you are considering the number of children you will have. You want at most 3 children. This means that 3 children is the most that you wish to have. So, for example, you would not want to have 4 children. The following table gives a list of some key words to know. Suppose a random variable X had possible values of 0 through 5. Question: Based upon this distribution, do you think it would be unusual to change majors 2 or more times? P(X ≥ 2) = 0.35. So, 35% of the time a student changes majors 2 or more times. This means that it is not unusual to do so. Question: Do you think it would be unusual to change majors 4 or more times? P(X ≥ 4) = 0.03. So, 3% of the time a student changes majors 4 or more times. This means that it is fairly unusual to do so. We can even answer more difficult questions using our probability rules! Question: What is the probability of changing majors only once given at least one change in major. = (0.37)/(0.37+0.23+.0.09+0.02+0.01) = 0.37/0.72 = 0.5139. So, among students who change majors, 51% of these students will only change majors one time. After we learn about means and standard deviations, we will have another way to answer these types of questions. LO 6.13: Find the mean, variance, and standard deviation of a discrete random variable. In the Exploratory Data Analysis (EDA) section, we displayed the distribution of one quantitative variable with a histogram, and supplemented it with numerical measures of center and spread. We are doing the same thing here. We display the probability distribution of a discrete random variable with a table, formula or histogram. And supplement it with numerical measures of the center and spread of the probability distribution. These measures are the mean and standard deviation of the random variable. This section will be devoted to introducing these measures. As before, we’ll start with the numerical measure of center, the mean. Let’s begin by revisiting an example we saw in EDA. Recall that we used the following data from 3 World Cup tournaments (a total of 192 games) to introduce the idea of a weighted average. We’ve added a third column to our table that gives us relative frequencies. Notice that the mean is each number of goals per game multiplied by its relative frequency. = 2.36, rounded to two decimal places. In Exploratory Data Analysis, we used the mean of a sample of quantitative values—their arithmetic average—to tell the center of their distribution. We also saw how a weighted mean was used when we had a frequency table. These frequencies can be changed to relative frequencies. So we are essentially using the relative frequency approach to find probabilities. We can use this to find the mean, or center, of a probability distribution for a discrete random variable, which will be a weighted average of its values; the more probable a value is the more weight it gets. As always, it is important to distinguish between a concrete sample of observed values for a variable versus an abstract population of all values taken by a random variable in the long run. Whereas we denoted the mean of a sample as x-bar, we now denote the mean of a random variable using the Greek letter mu with a subscript for the random variable we are using. Let’s see how this is done by looking at a specific example. In general, the mean of a random variable tells us its “long-run” average value. It is sometimes referred to as the expected valueof the random variable. Although “expected value” is a common, and even preferred term in the field of statistics, this expression may be somewhat misleading, because in many cases it is impossible for a random variable to actually equal its expected value. For example, the mean number of goals for a World Cup soccer game is 2.36. But we can never expect any single game to result in 2.36 goals, since it is not possible to score a fraction of a goal. Rather, 2.36 is the long-run average of all World Cup soccer games. In the case of Xavier’s production line, the mean number of defective parts produced in an hour is 1.8. But the actual number of defective parts produced in any given hour can never equal 1.8, since it must take whole number values. 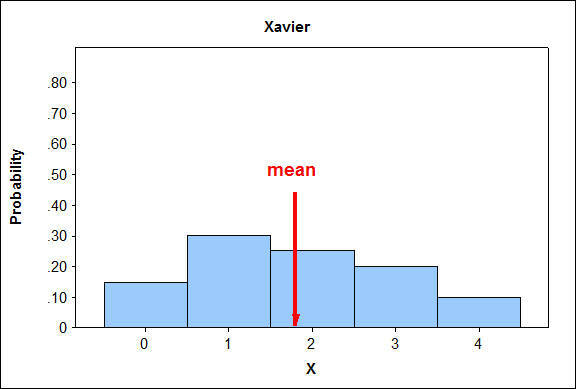 Recall the probability distribution of the random variable X, representing the number of defective parts in an hour produced by Xavier’s production line. Look at both probability distributions. Both X and Y take the same possible values (0, 1, 2, 3, 4). However, they are very different in the way the probability is distributed among these values. In Exploratory Data Analysis, we used the mean of a sample of quantitative values (their arithmetic average, x-bar) to tell the center of their distribution, and the standard deviation (s) to tell the typical distance of sample values from their mean. We described the center of a probability distribution for a random variable by reporting its mean which we denoted by the Greek letter mu. Now we would like to establish an accompanying measure of spread. We will also focus more frequently than before on the squared standard deviation, called the variance, because some important rules we need to invoke are in terms of variance rather than standard deviation. We found the mean number of defective parts produced per hour to be 1.8. Obviously, there is variation about this mean: some hours as few as 0 defective parts are produced, whereas in other hours as many as 4 are produced. Typically, how far does the number of defective parts fall from the mean of 1.8? As we did for the spread of sample values, we measure the spread of a random variable by calculating the square root of the average squared deviation from the mean. Now “average” is a weighted average, where more probable values of the random variable are accordingly given more weight. How do we interpret the standard deviation of X? Xavier’s production line produces an average of 1.80 defective parts per hour. The number of defective parts varies from hour to hour; typically (or, on average), it is about 1.21 away from the mean 1.80. From that result we subtract the square of the mean to find the variance. The purpose of the next activity is to give you better intuition about the mean and standard deviation of a random variable. Look carefully at both probability distributions. Both X and Y take the same possible values (0, 1, 2, 3, 4). We now want to get a sense about how the different probability distributions impact their standard deviations. Recall that the standard deviation of a random variable can be interpreted as a typical (or the long-run average) distance between the value of X and its mean. So, 75% of the time Y will assume a value (3) that is very close to its mean (2.7), while X will assume a value (2) that is close to its mean (1.8) much less often—only 25% of the time. The long-run average, then, of the distance between the values of Y and their mean will be much smaller than the long-run average of the distance between the values of X and their mean. Yves’ production line produces an average of 2.70 defective parts per hour. The number of defective parts varies from hour to hour; typically (or, on average), it is about 0.85 away from 2.70. When we compare distributions, the distribution in which it is more likely to find values that are further from the mean will have a larger standard deviation. Likewise, the distribution in which it is less likely to find values that are further from the mean will have the smaller standard deviation. As we have stated before, using the mean and standard deviation gives us another way to assess which values of a random variable are unusual. For reasonably symmetric distributions, any values of a random variable that fall within 2 or 3 standard deviations of the mean would be considered ordinary (not unusual). EXAMPLE: Xavier’s Production Line—Unusual or Not? Would it be considered unusual to have 4 defective parts per hour? We know that the mean is 1.8 and the standard deviation is 1.21. Ordinary values are within 2 (or 3) standard deviations of the mean. 1.8 + 2(1.21) = 4.22. This gives us an interval from -0.62 to 4.22. Since we cannot have a negative number of defective parts, the interval is essentially from 0 to 4.22. Because 4 is within this interval, it would be considered ordinary. Therefore, it is not unusual. Would it be considered unusual to have no defective parts? Zero is within 2 standard deviations of the mean, so it would not be considered unusual to have no defective parts. The following activity will reinforce this idea. Learn by Doing: Unusual or Not?